In England's top women's club league - the Tyrrells Premier 15s - Harlequins and Saracens secured their spots in the 2018/19 final at Franklin’s Gardens on Saturday 27 April, kick-off 17:45, in what will be a rematch of last year's final. Saracens defeated Wasps 31-13 in their semi-final at Allianz Park having topped the regular-season table with 17 wins from 18 games and maintained that form against a valiant Wasps side to ensure a spot in final in a fortnight’s time. Harlequins put in an impressive performance to beat Loughborough Lightning 26-10 in their own semi-final at the Twickenham Stoop to earn their place in the final for the second year running. Scotland international Jade Konkel scored two first-half tries to help inspire Harlequins Ladies to a 26-10 Tyrrells Premier 15s semi-final win over Loughborough Lightning. Carys Williams struck early for Lightning but the Londoners added second-half scores for Vickii Cornborough and Leanne Riley to set up a repeat of last year’s final against Saracens Women. The final four clash at Twickenham Stoop started with Harlequins in typically determined mood and after England fly-half Katy Daley-Mclean saw yellow for collapsing a maul the hosts took advantage with Konkel dotting down following a scrum. The visitors responded almost instantly on seven minutes as wing Williams touched down following a fantastic Emily Scarratt miss-pass, the Red Roses centre unable to convert the try. The physicality and pace of the match was relentless but the scores stayed level until 38 minutes, with No.8 Konkel driving over from a metre out and Ellie Green converting. Harlequins led 12-5 at the break but extended the advantage 12 minutes into the second half, prop Cornborough powering over from short distance and Green once again adding the extras. Loughborough were still very much in the match but the telling blow was delivered by England scrum-half Leanne Riley, who scrambled over from a quick-tap penalty on 69 minutes. There was still time for Meg Davey to dive over in the corner to reduce the deficit to 16, but it’s Harlequins who line up the mouth-watering final against Saracens at Franklin’s Gardens in two weeks’ time. 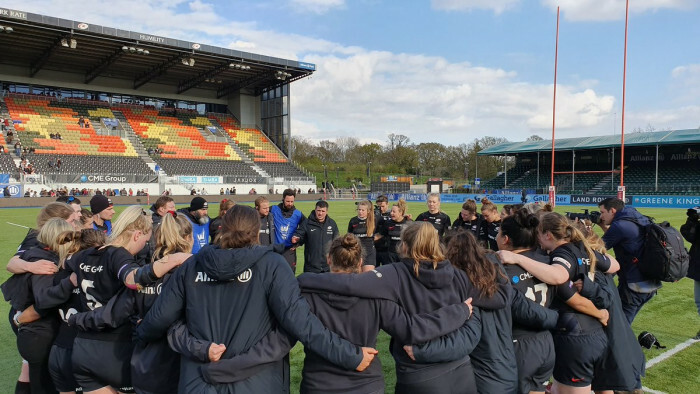 On Saturday, England prop Hannah Botterman helped move Saracens Women within one victory of defending their Tyrrells Premier 15s title with an inspired display in a 31-13 semi-final win over Wasps FC Ladies at Allianz Park. Botterman was a constant threat with ball in hand, a powerhouse in the scrum and epitomised her team’s dominance in the pack – crossing for one of five Saracens tries as the hosts pulled away after the break. Sarries topped the regular-season table with 17 wins from 18 games and maintained that form against a valiant Wasps side to ensure a spot in the Tyrrells Premier 15s final at Franklin’s Gardens in a fortnight’s time – against either Harlequins Ladies or Loughborough Lightning. After a cagey opening, Saracens fly-half Zoe Harrison almost broke through on 15 minutes but instead popped up to Jodie Rettie to race clear and the score was 12-0 shortly after as effective offloading preceded a neat break down the left from Sarah McKenna, who then released skipper Lotte Clapp for the score in the corner. Two Lizzie Goulden penalties narrowed the deficit to 12-6 at half-time but the second 40 minutes saw Saracens assert their dominance and pull away to reach the final for the second consecutive year. Impressive breakdown work allowed England star Poppy Cleall to burrow across the line before Botterman crashed over from close-range and Rosie Galligan put the result beyond doubt on 65 minutes with another score. Wasps did have the final say with a deserved consolation try by Louise Dodds but it is Saracens who will have the opportunity to defend their crown in Northampton.